Maybe you’ve already seen it? 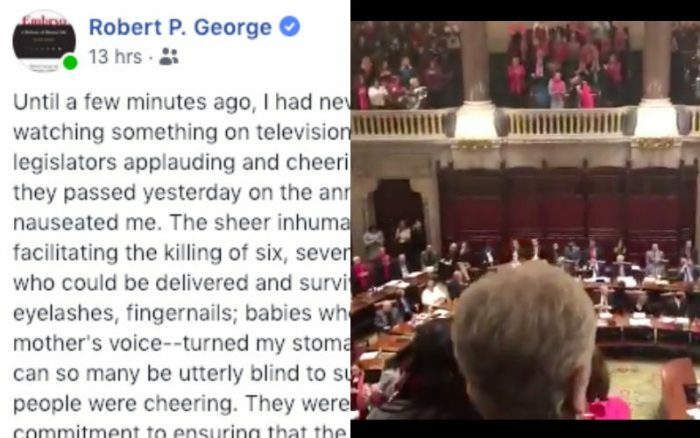 New York state recently passed legislation that expands access to abortion in that state – and there’s a video going viral of the lawmakers standing and actually cheering its passage. Yes, cheering the fact that more children will be legally killed in their state (you can view the video below). The video has inspired many strong reactions from pro-lifers, including Dr. Robert P. George, law professor at Princeton and well-known Catholic. “The sheer inhumanity of applauding an act licensing and facilitating the killing of six, seven, eight, even nine month babies–babies who could be delivered and survive; babies with fully formed faces, eyelashes, fingernails; babies who hear and are familiar with their mother’s voice–turned my stomach. If the video doesn’t work you, click here to view it on Twitter. Please pray for the conversion of those who support abortion!